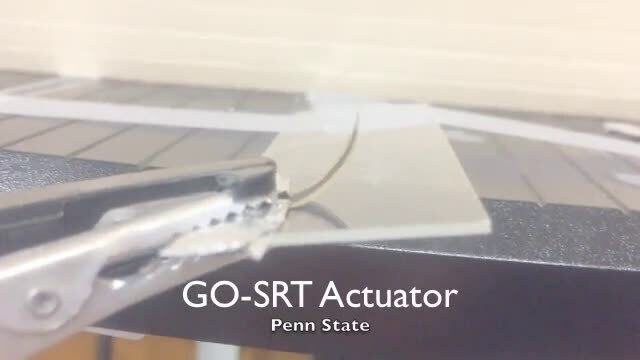 Squid-inspired proteins can act as programmable assemblers of 2D materials, like graphene oxide, to form hybrid materials with minute spacing between layers suitable for high-efficiency devices including flexible electronics, energy storage systems and mechanical actuators, according to an interdisciplinary team of Penn State researchers. "2D layered materials can be made by vacuum (chemical vapor) deposition," said Melik C. Demirel, Pierce Development Professor and professor of engineering science and mechanics . "But the process is expensive and takes a long time. With chemical vapor deposition the problem also is we can't scale up." Materials like graphene oxide are composed of single layers of molecules connected in a plain. While the length and breadth of the sheet can be anything, the height is only that of one molecule. To make usable composites and devices, 2D materials must be stacked either in piles of identical sheets or combinations of sheets of different composition stacked to specification. Together with Mauricio Terrones, professor of physics, chemistry and materials science and engineering, and director of 2D Atomic Center, Penn State, Demirel and his team are currently looking at stacking sheets of identical materials using a solvent approach that self assembles. "Using the solvent approach the molecules are self-assembling, self-healing and flexible," said Demirel. "Currently we are stacking identical layers, but they don't have to be the same." To make these molecular composites using solvent technology, the researchers combined the sheets of graphene oxide with synthetic polymers patterned after proteins found in squid ring teeth. One end of the protein strand attaches to the edge of a graphene oxide sheet and the other end attaches to the edge of another graphene dioxide sheet. The sheets of graphene oxide self-assemble to stack up with proteins linking the edges of the sheets. The length of these tandem repeat proteins—their molecular weight—determines the distance between sheets. "Up until now, no one has been able to stack composite layers closer than 1 nanometer," said Demirel. "We can stack them at atomistic precision with 0.4, 0.6 or 0.9 nanometer resolution by choosing the right molecular weight of the same protein. Respectively." The researchers tested this material's ability to make tiny devices by creating bimorph thermal actuators. A bimorph activator is a small piece of material made from two different layers and placed perpendicular to a surface. When activated, usually by an electric current, the bimorph actuator bends from the perpendicular. The researchers report in the July issue of Carbon that "these novel molecular composite bimorph actuators can facilitate thermal actuation at voltages as low as about 2 volts, and they boast energy efficiencies 18 times better than regular bimorph actuators assembled using bulk graphene oxide and tandem repeat films." They believe that higher molecular weight proteins could reach much higher displacements.